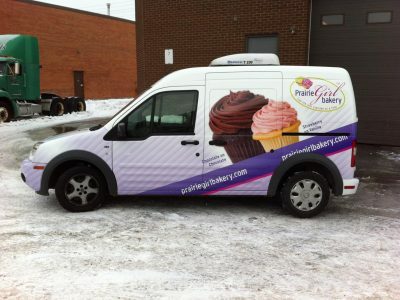 Vehicle wraps and graphics have been our specialty since 2008. 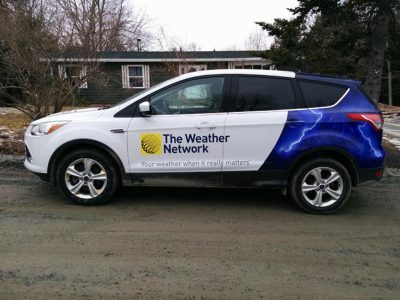 Since 2008 we have installed wraps and graphics on well over 2000 vehicles and counting. While our company began as www.marketyourcar.com (our vehicle wraps and graphics division) and only specialized in vehicles at first, it has grown significantly and will always focus on quality and services when is comes to anything we do. We have wrapped vehicles for all different types of businesses from small to large. Our installation capabilities allow us to cover Canada from coast to coast. 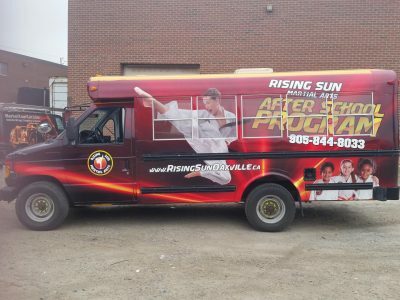 Our team of award winning designers can create vibrant and attention grabbing graphics for anything from car wraps and bus wraps, to truck wraps and trailer wraps. 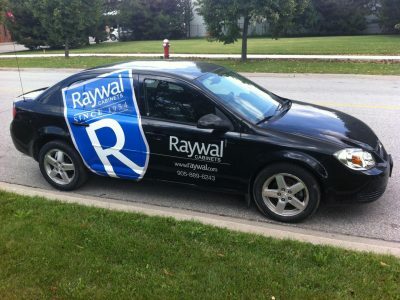 The key to successful designs on car wraps is to allow them to catch peoples eyes without being too cluttered. If there are too many images or too much information people will not know what the advertisement is all about. Whether the mobile billboard is supposed to promote the company brand, service or product, it has to follow certain principles because most people will only have a few seconds to understand what it is while it drives by. Vehicle wraps – especially car wraps – are not easy to design. Cars come in many shapes and sizes and have a lot of curves. 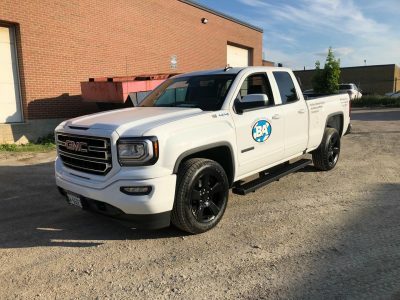 Unlike truck wraps or trailer wraps which have flat rectangular surfaces which the graphics are installed on, car wraps have to wrap around the car which is a 3D object. A good design does this seamlessly by allowing all the contours on the sides meet the front and back without having the graphics meet randomly and not line up. Vehicles also have many aspects which need to be taken into consideration while designs a vehicle wrap. These aspects include lights, trim, license plates, door jams, sun roofs, antennas, grills, hood vents, etc. 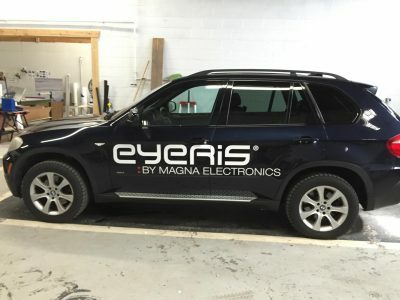 If these aspects are not taken into consideration during the design process, when the car wrap is finished you can easily cut off parts of the print (such as a person’s printed head) by some window trim, lettering could be missing because of a door jam, and so on. 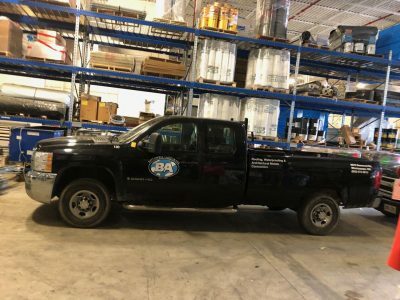 Our constant need for quality, service, and satisfaction has help us grow from a company renting space in 2008 to having a 8,000 sq/ft facility where every job from small car wraps to large fleet truck and trailer wraps is produced and installed in-house with our employees. 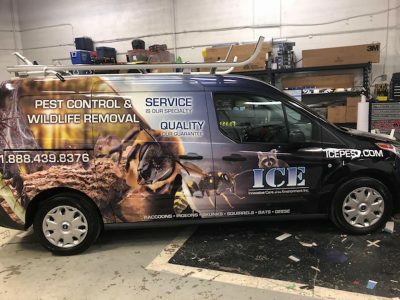 Having full time designers and installers who help guide our customers though the process of designing and installing vehicle graphics gives us a major edge in the industry. 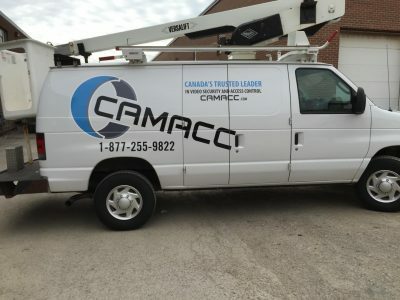 Unlike most print companies who have just jumped on the band wagon since car wraps, bus wraps, truck and trailer wraps have become ever so popular, having in-house professionals allows us to complete projects quickly and properly without the need to constantly subcontract installers to install every wrap we do. Our knowledgeable staff is genuinely excited and interested in what we do and are always more then willing to help all our our customers accomplish their needs. 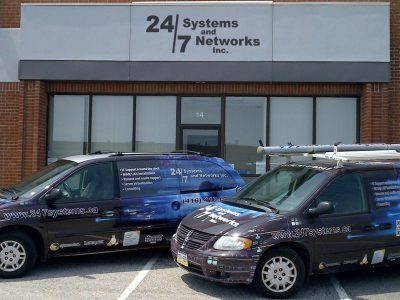 Our installers are some of the best in the business. They may not be the fastest but that’s because their primary focus is on quality not quantity.Even though we love seeing our customers often, we would much rather see them because they need another car wrapped and not because something we installed has failed. This is why we train all of our installers in-house with a heavy focus on doing it right the first time. 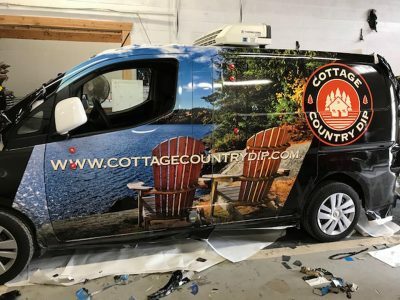 There are many challenges when it comes to vehicle wrap installations. Some of them include contours on cars, high failure points such as channels and wheel wells, rivets on truck and trailers, etc. 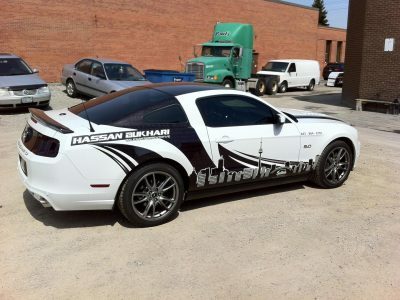 Our installers are passionate about vehicle wraps which makes them that much better at their jobs. Since our staff are human and not machines they do occasionally miss something. If that is the case you will never hear any excuses from us. It’s our work out there and we want it looking good. We fix our mistakes no questions asked. 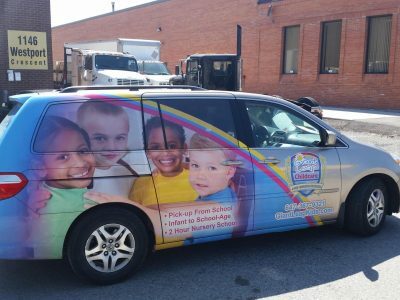 A vehicle wrap is essentially when graphics are printed on vinyl with an adhesive backing and installed on any vehicle. Other terms for vehicle wraps are car wrap, truck wrap, bus wrap, trailer wrap, etc. 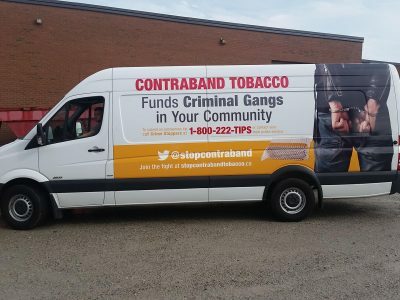 Partial wraps are when only a portion of the vehicle is covered with graphics. These are also also call half wraps as they often cover half the vehicle but can also cover less or more depending on the design. 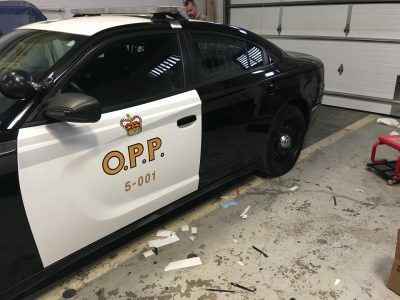 People also sometimes refer to vehicle graphics as decals. 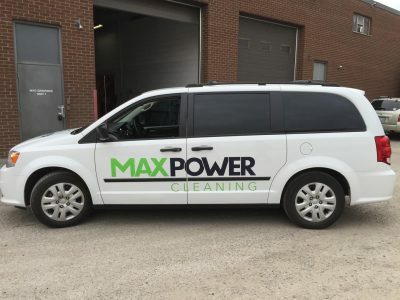 Decals usually consist of simple logos or text being places on vehicles rather then covering large portions of the vehicle surface with graphics. 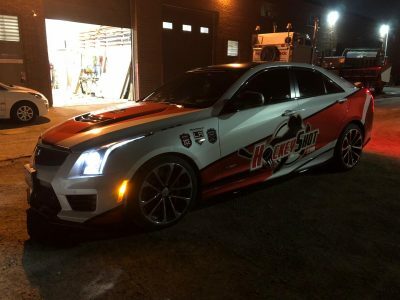 What is the process of getting my car wrapped? The entire process begins with design. this stage usually takes the longest. A customer may have an idea in mind or have no idea what they would like to do. 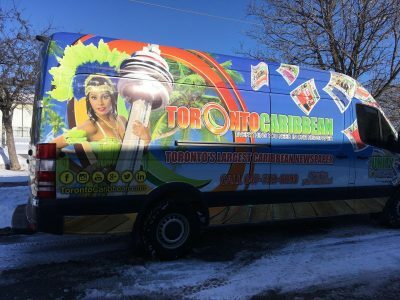 Our designers are very creative and can design great vehicle wraps from scratch or can take a customers idea and translate it into an attention grabbing mobile billboard. In cases where companies have their own design departments we take on a support role to where we can advise and review to ensure the graphics come out perfect. Once the design process is finished. Production can take anywhere from 2-5 days depending on the type of project. It takes roughly one day to setup and print the graphics. The printed graphics then need a minimum of 24 hours to out-gas and dry before lamination. 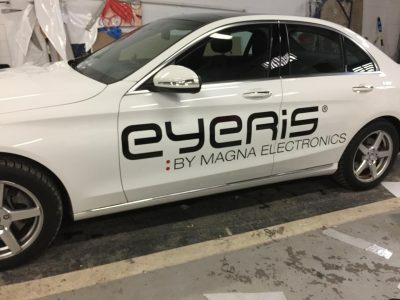 All graphics must be laminated with the proper laminate before being installed on a vehicle to prevent fading from UV, rain, wear and tear, and to give then a long life after installation. When the graphics are ready for installation our professional installer can install then on the vehicle. This can take anywhere from a couple of hours for simple decals to 2-4 days for 53 ft trailers and food trucks. A regular car wrap usually takes 1 day. Some people ask us why does it take so long. And the simple answer is because we do it properly. 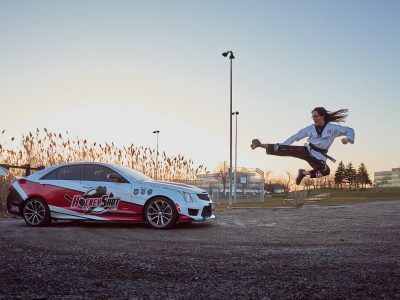 Why do the prices for car wraps vary so much from company to company? Every company in the industry will most likely have a different answer for this question. In the end it boils down to 4 major points: Size of company, materials used. quality of installation, and quality of printing. Size of Company: A price from a company which operates out of a persons garage will most likely be much smaller then an established business with a facility and employees. Going with an established company will most likely ensure they will be around in 5-10 years while someone just starting out may not always make it. 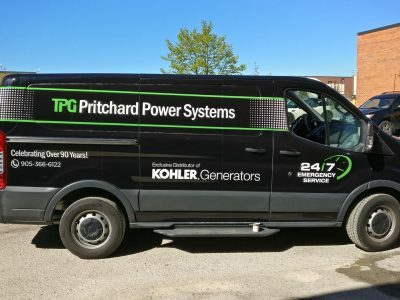 Professional staff, proper equipment, and a facility have certain costs and too many companies undervalue the labor and cost of materials which go into vehicle graphics. Air Release Technology – allows the vinyl to be installed without air bubbles underneath because it escapes through air channels specially designed for the purpose. Conform-ability – some vinyls are manufactured in a way that allows them to be stretched up 150% of its original size while some are not. This is a very important feature when is comes to vehicle wraps because of all the different curves on any vehicle. Adhesive Type – some vinyl adhesives are made to be permanent, temporary or removable. choosing the wrong one on a vehicle can damage the paint upon removal. Life – Some vinyl are made for short term application such as 1 month while other are made to last 10+ years. 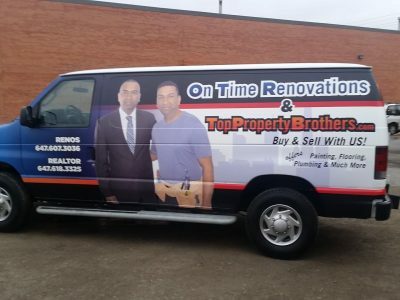 A vehicle wrap done using the proper materials and installed correctly should last 5+ years. Design Quality – no matter how good the printer is, if the design files are low resolution they will print terribly. It is the designers job to ensure the design files are high enough resolution for the size of print that is required. A good print company will double check files and advise customers of the quality before printing. Resolution – printers have profiles which tell them how much ink to drop to make a certain color. These profiles have different resolutions which they print at. The higher the resolution the more ink the printer drops and slower it prints. Companies often choose the low resolution setting which allows them to print much faster and do more jobs per day with 1 machine. Printer Maintenance – a printers head takes a beating from printing graphics all day long. because of that it needs to be cleaned regularly. If it is not cleaned regularly then the head will clog up and produce poor quality prints. Printer Setup – Every printer has internal setting and mechanisms which need to be adjusted over time. If these adjustments are not done then the print will come out looking poor. These settings adjust the speed at which the printer prints, the distance between passes as it prints large panels, the alignment of the head as it moves to ensure it drops in in the right place, etc. These are all vital to ensure good quality prints. 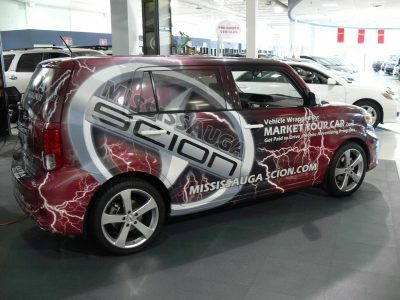 Quality of Installation: The quality of installation plays a major role in the life of a wrap. If installed improperly the wrap can begin to fail the next day and not last longer than a couple months. If, however, the installation is done properly while using the correct materials a wrap on a truck or trailer can last 10+ years. 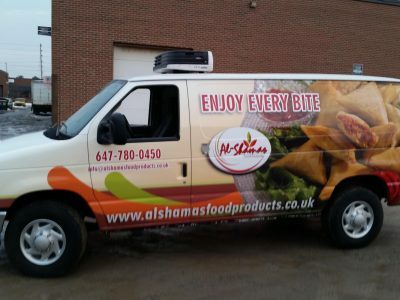 Vehicle Wraps are an exceptional way to build brand awareness. They take advantage of a vehicle which already drives around and transforms itself into a mobile billboard. MYC Graphics can wrap anything from a small car to a 53 foot trailer. No matter the size of the fleet we can accommodate it in our facility in Mississauga. When you compare the cost of a vehicle wrap to other forms of advertising, it’s easily seen how inexpensive they are in comparison. 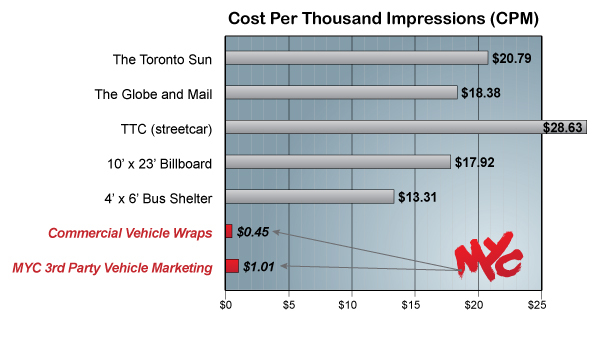 The table to the right shows the cost comparison between vehicle wraps and other forms of advertising. The table below shows the annualized average cost of wrapping various vehicles. We’ve done the math and a wrapped vehicle in the GTA will generate (conservatively) 7,700,000 views in a single year! That works out to 21,095 views per day. 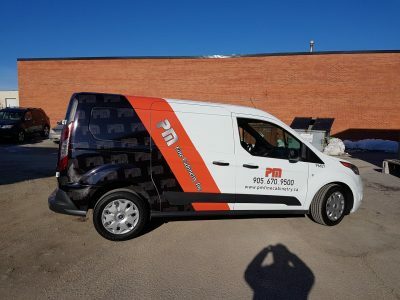 For more detailed information about vehicle graphics please visit Market Your Car Inc., our vehicle graphics divisions website. 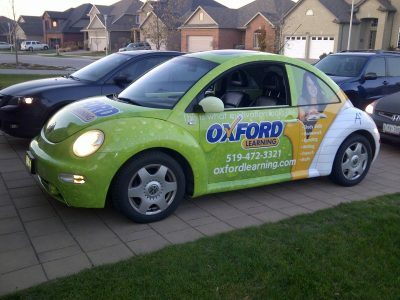 Studies estimate that vehicle wraps can garner as many as 30,000 to 70,000 daily impressions. 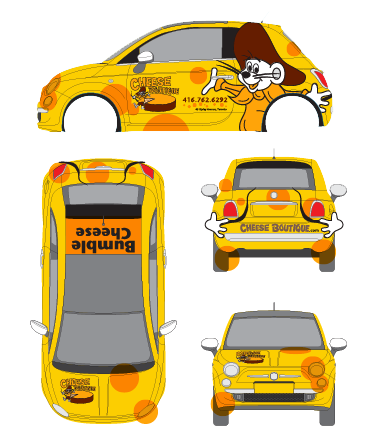 Vehicle wraps have one of the lower CPMs in the industry making them an important part of the marketing mix. 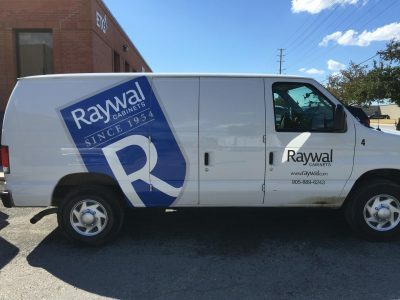 Vehicle Wrap can last 5+ years if installed properly and with the right material. Truck and trailer graphics can last 10+ years if taken care of properly. The life of the wrap really depends on how it is taken care of by the owner. Our Vehicle Maintenance Guide explains how to take care of a wrap properly.